The current Information Society requires new skills for personal, labor and social inclusion. Among the so-called Twenty-First Century Skills (Care et al. (eds) in Assessment and teaching of 21st century skills, Springer, New York, 2018) is Problem Solving in Technology Rich Environments (PS-TRE) competence evaluated in PISA and PIAAC tests (OECD in Survey of adult skills (PIAAC). Retrieved from https://goo.gl/cpb3fQ (2016)). This skill, although currently receiving considerable attention in compulsory education, has not received the same level of thought in the case of adult education. In this article, the presence of the PS-TRE skill among adults of working age (25–65 years) in Europe is analysed in relation to the factors that potentially affect a higher score in this skill. This analysis is carried out using structural equations modelling, taking into account socio-personal and educational factors, as well as the use of different skills in work and daily life. The results indicate that educational level and the use of different skills (reading, numerical, related to ICT) at home and at work, as well as participation in non-formal education activities, decisively relate to a higher level of PS-TRE. This result is positively mediated through risk factors such as being older or being a woman. This study concludes that it is necessary to reinforce these skills, not only in children, but also in the adult population, in order to avoid social and labour exclusion. Bocconi, S., Chioccariello, A., Dettori, G., Ferrari, A., & Engelhardt, K. (2016). 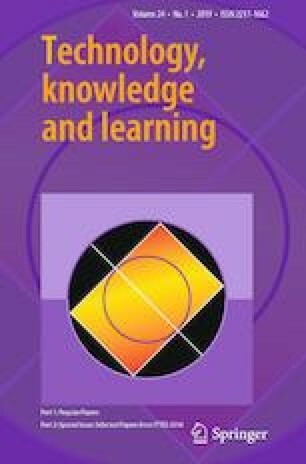 Developing computational thinking in compulsory education—Implications for policy and practice; EUR 28295 EN; https://doi.org/10.2791/792158. Eurostat. (2017). Population data. http://ec.europa.eu/eurostat/web/products-datasets/-/migr_pop3ctb. Accessed 12 May 2018. Goos, M. (2013). How the world of work is changing: A review of the evidence, ILO research paper, pp. 1–54. www.ilo.org/public/english/dialogue/actemp/downloads/events/2013/symp/how_worldofwork_changing.pdf. Accessed 12 May 2018. Harris, K. (2015). Integrating digital literacy into English language instruction: Issue brief. https://goo.gl/XWpyWG. Accessed 12 May 2018. Newman, A., Rosbash, T., & Sarkisian, L. (2015). Learning for life: The opportunity for technology to transform adult education. Tyton Partners. http://tytonpartners.com/tyton-wp/wp-content/uploads/2015/03/Learning-for-Life_The-Oppty-for-Tech-to-Transform-Adult-Education_March-20151.pdf. Accessed 12 May 2018. OECD. (2009). PIAAC problem solving in technology-rich environments: A conceptual framework. https://goo.gl/drJRML. Accessed 12 May 2018. OECD. (2013). OECD skills outlook 2013: First results from the survey of adult skills. OECD Publishing. https://goo.gl/3BtmvS. Accessed 12 May 2018. OECD. (2016). Survey of adult skills (PIAAC). Retrieved from https://goo.gl/cpb3fQ. Accessed 12 May 2018. P21-Partnership for 21st Century Learning. (2017). P21’s framework for 21st century learning. https://goo.gl/Y58DGn. Accessed 12 May 2018. Wing, J. (2014). Computational thinking benefits society. Social issues in computing. http://socialissues.cs.toronto.edu/2014/01/computational-thinking. Accessed 12 May 2018.